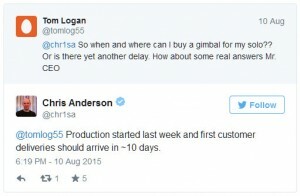 A Tweet from 3DR CEO Chris Anderson says the Solo gimbal has been in production now for a week with gimbals expected to be with the first customers in 10 days. 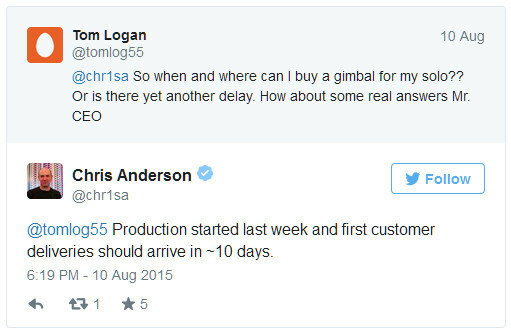 We’re fairly confident the gimbal will deliver, indeed we received Solos that we ordered and the smart moves do work as advertised. The only alarm bell is 3DR have put out exclusively 1080p content. The wide mode in 4K will likely get the legs in shot, meaning for this mode a 4.35mm or 5.4mm GoPro lens change will be needed, so we can understand the lack of 4K content, however, we’re surprised no 2.7k footage has been shown as we were hoping the medium mode would be fine. Maybe it will be, but it looks like we won’t know until we try it ourselves. The Solo is now readily available in the UK but it should be noted it didn’t support the PAL video system for launch, so for the time being it’s necessary to use NTSC, a fix for this is due soon and will hopefully make it out in time for the arrival of the gimbal.